Tomorrow, November 24, will mark seven months since the Rana Plaza collapsed, killing over a thousand garment workers, overwhelmingly women. Tomorrow, November 24, will also mark the one-year anniversary of the Tazreen Fashion factory fire in which over a hundred garment workers were killed. Almost all of those killed were women. These were not accidents but rather pieces of a plan in which the lives of women, of women workers, of Asian women workers count for less than nothing. Across the globe, factory workers struggle with corporate exploitation. Factory workers in sectors, such as garment and textile, that are “reserved” for women workers struggle with super-exploitation. That is part of the tragic and the everyday of the garment industry. But this tale of “factory victims” is more particular. This is about U.S.-based corporate global development plans, in which women workers of color are not only worth less than the machines they work at. For Walmart, Sears, Children’s Place and their confreres, those women are worth less than the chairs on which they sit every day, producing goods and profits. 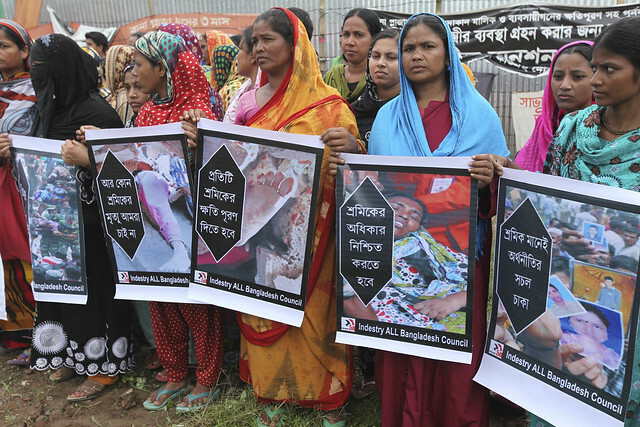 “80% of Rana Plaza survivors are women. Now they find themselves in a situation more desperate than ever.” That too is part of the plan. That were no accidents; there were massacres. Remember that on Monday, as we enter, again, the 16 Days of Activism Against Gender Violence. Remember the specter of “factory victims’ that haunts the end-of-year shopping seasons.